As Americans, we have the utmost respect for our flag and are to never intentionally damage it in any way, there is one known case of the American flag being torn to pieces and celebrated for it. This was explorer Robert Peary (1856-1920) whom scattered the shreds at the North Pole, he was the first recognized American to arrive at the North Pole in 1909. Recognized as there was a controversy over the first American to reach the North Pole, the accepted history is that Robert Peary was the first American to make it to the top of the earth. 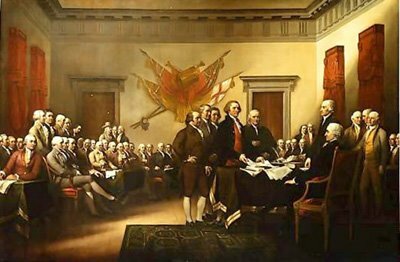 Famous historical painting by John Trumbull (1756-1843), named Declaration of Independence. Consequently, this painting appears on the reverse of a $2 bill.